Should You Really Quit Your Job to Start a Business? “You may adhere to the philosophy of burning your bridges. Arguably, when you keep your job (or continue pursuing that degree as a secondary plan), you are not really committed to your business. Once you quit everything else, you have no choice but to proceed. Failure is not an option“. Much has been written about the differences in mindset between employees and entrepreneurs. Robert Kiyosaki explains these differences in detail in many of his books and seminars. In books such as Rich Dad Poor Dad, he describes the entrepreneur as self-motivated and someone who ultimately aims at earning passive income. The employee, meanwhile, is stuck in the mindset of trading his time for money. So if you are currently an employee, how exactly do you make the transition to self-employment or entrepreneurship? Sure, we can discuss the various qualities you need. But there are also the more practical considerations. 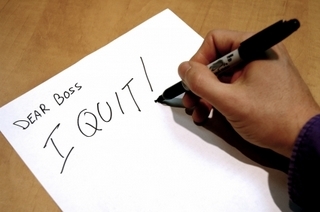 One of the first questions to address if you’re currently employed is whether you should quit your job. There’s no single right answer. In order to find the answer for yourself, take an honest look at your current situation. It’s not always a job people consider quitting—sometimes it’s college, law school or graduate school. Either way, the question is whether you should abandon everything and put all your efforts into starting your own business. On the plus side, if you don’t have any distractions, you can put all your energy into your new business. Let’s face it—no matter how motivated you may be, it can be tough to come home from a long day at work and start working on ad copy or building your business blog. You may adhere to the philosophy of burning your bridges. Arguably, when you keep your job (or continue pursuing that degree as a secondary plan), you are not really committed to your business. Once you quit everything else, you have no choice but to proceed. Failure is not an option. On the other hand, quitting your job can also put you under a lot of pressure. If you have to start living off of your parents, your spouse or your credit cards, it can be very challenging to stay focused and to avoid panicking when your business doesn’t take off immediately. As dismal as your day job might be, at least it keeps the bill collectors at bay. You have to consider your circumstances carefully. If your situation is such that your business will have to start turning a profit within a few weeks for you to stay afloat, you are probably better off keeping your job and starting your business in a more gradual manner. Can You Find Positive Value in Your Job? Not everyone takes Kiyosaki’s extreme view that divides the world neatly into employees and entrepreneurs. There’s another constructive way to look at it. The belief that everyone is ultimately an entrepreneur (or will soon have to become one) is quickly gaining traction. As notions such as job security become ever harder to cling to, and more companies engage in practices such as hiring temp workers, we are quickly entering an age where many people are either freelancers or entrepreneurs. Even when we’re working at a 9-to-5 job, we are essentially selling services to a buyer. You can, therefore, think of your job as one aspect of your business—perhaps one that you hope to leave behind in the near future. If your current job has anything to do with the type of business you want to start, so much the better. You can focus on learning as much as you can about the field and making valuable contacts. On the other hand, your job may truly be making it more difficult for you to move forward with your goals. If you’re working in a field where you have zero interest, or at a job that completely bores you, it may be worth the risk to abandon it. It’s always worth asking yourself if there’s not a way to make peace with your current job until you start seeing some cash flow from your business. Whether or not you should leave your job is a personal decision that always requires a great deal of thought. It’s best to approach the question in a balanced way and leave behind any simplistic ideas, such as, “It’s irresponsible to quit my job” or conversely, “If I were a real entrepreneur, I wouldn’t think twice about quitting my day job.” You need to weigh the issues carefully and come to the conclusion that’s right for you.